The Cleveland Indians are rolling toward a third straight division title, and once again, they're doing it on the strength of elite starting pitching. 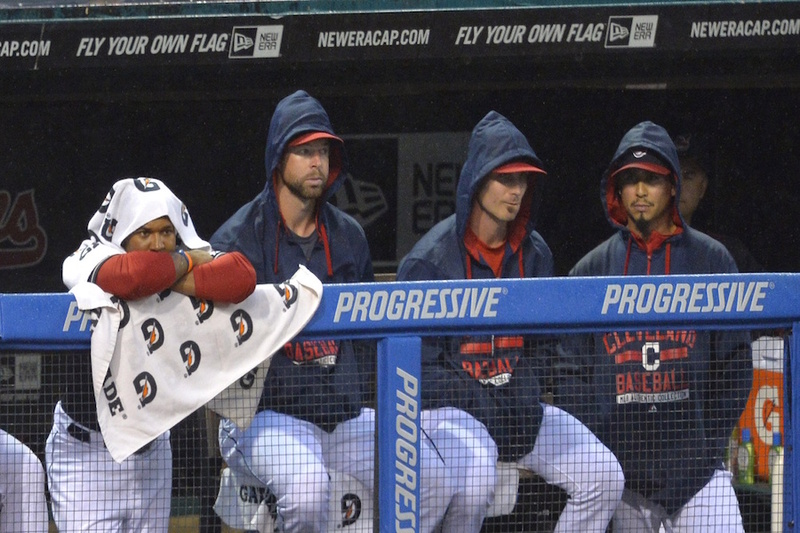 Here's what's scary: Corey Kluber and Carlos Carrasco, the duo that has powered this unit ever since Cleveland's return to relevance in 2014, both remain under control for years to come, and at extremely reasonable rates. It's safe to say the wizardry performed by Cleveland's front office hasn't gone unnoticed by Derek Falvey. After all, he was part of the group that orchestrated those brilliant contracts. In a letter to season-ticket holders, Falvey used a familiar term when rationalizing the club's deadline fire-sale, referencing a desire to "achieve sustainable championship-caliber baseball." Admittedly, it sounds like the usual jargon of front office types trying to soothe an agitated fanbase amidst tumultuous times, but... Falvey is a bit of an authority on the subject. He was a key fixture in Cleveland's front office when the Indians struck long-term deals with Kluber (a five-year, $38.5 million extension) and Carrasco (four years, $22 million) on the same weekend in April of 2015. Kluber was four years away from free agency, Carrasco three. The figures listed above don't fully convey the beauty of these incredibly team-friendly contracts, both of which include a pair of economical team option years. Although Carrasco's guaranteed term expires after this year, Cleveland can bring him back for $9 million in 2019 and $9.5 million 2020. Given that the 31-year-old is once again performing at an exemplary level, those decisions are looking like no-brainers. The same is true for Kluber's options in 2020 ($13.5M) and 2021 ($14M). A two-time (so far) Cy Young winner making Ricky Nolasco-type money. Wow. Granted, the salaries for both players can escalate based on Cy Young finishes, but either way we are talking about unbelievably favorable pacts for the club, which set itself up for inexpensive prolonged control if the starters fulfilled their promise (as they have), with escape valves if things went awry. In retrospect, these contracts almost seem too good to be true. But they speak to the powerful value of long-term security for a young and somewhat unestablished major-league pitcher. It's not like Kluber or Carrasco were leveraged all that much; the former was coming off a Cy Young season in 2014, and the latter had broken out with a 2.55 ERA in 134 frames. But when you've earned relatively little, and you know you're one elbow pinch away from everything changing, the prospect of many millions in guaranteed money can be very alluring. Which brings us back to Mr. Falvey, and his current position overseeing baseball operations for the Minnesota Twins. He now finds himself with another rising frontline arm in Jose Berrios. Like Cleveland, Minnesota faces finite payroll constraints. Maintaining a reasonable price tag on core pieces like Berrios is critical in the "sustainable championship-caliber baseball" framework, and it's why those savvy extensions for Kluber and Carrasco are such critical ingredients in Cleveland's ongoing supremacy. Berrios is under team control for four more seasons after this one. The Twins have almost no hope of a striking deal with him quite as favorable as those of Kluber and Carrasco – both late bloomers who followed winding paths to stardom. Berrios is a 24-year-old All-Star with an impeccable record of health; needless to say, it'll be tougher to impress upon him the downside of holding steady and betting on himself. But that downside exists. He and his agent both know it. No one is invincible. With free agency still so far away, the Twins have enough leverage to work out a mutually beneficial deal that locks up Berrios into his 30s while still giving the team some protection. I really like the makeup of those Kluber/Carrasco contracts – the team option years are fairly cheap but in both cases can be increased up to $4 million by Cy Young finishes, bringing them closer to market value. So in a way, the pitchers still were able to bet on themselves, and remain highly incentivized to keep improving. I don't believe Berrios needs that incentive. But, knowing what I know about him, I think he'd embrace it. Whatever the terms, Minnesota would be very wise to make an extension for Berrios their No.1 priority for the offseason. Obviously, that'll mean loosening their stance after they reportedly tried and came short last winter. But a rotation building block is worth his weight in gold. No one needs to tell Derek Falvey that. Nicely done.That is why we should bring up Romero and Gonsalves now.Let's see the rotation building blocks and determine who else should be put in place for this kind of plan.I think we have the people in the minors now if they do not get injured.No more FA fillers.Build a platform for success. It would be great to lock in a good rotation.Last year I believe that was the hope with the young lineup.If I remember correctly, the front office said they had contract discussions with 5 of the players but nobody signed.I wonder if the FO is low-balling the offers or if the players now feel it better to bet on themselves and not sign these types of contracts. Thanks, Nick, nice presentation of what the Twins need to get done. Do they also extend Gibson this winter?Or is it too late? Then they have Bauer and Salazar for at least two more seasons and Clevinger for four more seasons. With all the money coming off the books it would be wise to extend Berrios before he becomes too expensive to resign. I think an 8 yr $120 million contract ($15 mill per season). That would secure Berrios long term at a reasonable yearly rate. It's a great question. I thought about touching on that here but it's not really the same discussion. I wonder what kind of extension would make sense for both sides. Probably deserving of its own article. I think a four year extension is reasonable. Gibson is not young and tossing $60m at him in guaranteed money might do the trick. 4/60M is exactly what I was about to suggest.I don't love that contract as a Twins fan/pretend FO guy....but I'd do it. Also, I wouldn't be opposed to offering Berrios something along the lines of 6/80M. (Maybe you have to go a bit higher? )This kid's make-up and talent are worth investing in IMO. I find it fascinating that so many would never draft a pitcher in round 1, because of injury concerns, but would commit 6-8 years on a contract to one. It seems like a disconnect. Of course, I don't agree on not drafting one early, so I'm probably more inclined to take the risk. I think it's also harder to sign Berrios than the two CLE pitchers because he already got a good bonus, not a great bonus, but a good one. Elite players are signing less and less contracts, if they are the kind that got paid at signing, because they see what happened to some of their peers. I flip flop on signing Berrios to a deal, and only because of injuries. That said, I'd offer him 6-8 years, and see what happens. There is real value in certainty (or as close as baseball can come), and he's a legit very good to great pitcher. Hmmmm......I'd offer a 4 year deal, meaning a 3 year extension. I don't think it happens, though. If I'm him, I want to be a FA in a year, unless the TWins really go big. I'm not sure you'd have to go that high because his earning potential over the next couple seasons is so limited. He's not even arb eligible until 2020. Would a structure like this make sense? Maybe the last couple years are team options, a la Kluber/Carrasco? That's 7 years, $74 million and seems pretty reasonable to me, especially if there are incentives that can boost his earnings based on performance. I wonder if the uncertainty of the free agent market would make a young player and his agent more open to something like this, too. Last offseason, tried to figure out what an extension might look like for Berrios using similar pitchers. Obviously the 2018 comes off of this, but it would then be a 6 year, $45M or a 7 year, $60M if the option was picked up. After an All Star season, probably have to bump up about $5-6 million for the arb years by waiting. and another million a year for those three free agent years... So, I think you could add $10 million to my deal from last year. 1.) He should make about $9-10 million next year in Arbtration. 2.) If he becomes a free agent (after pitching well again next year), he'd probably be in line for a 3-4 year deal in this new world of free agency. Probably at $14-16 million a year (think Alex Cobb range). 3.) It'd be nice to sign him to a 3 year deal this offseason, buying out two years of free agency, but he should want another year or two added to that because he would get those year if he actually did become a free agent. 4.) If he doesnt pitch well next year, he would likely be a one or two year guy at something like $15 million total, so him becoming a free agent is him betting on himself. I'd let him bet on himself, then bite the bullet and sign him back as a FA if that's where it ends up. Spend some of that "financial flexibility," to audition Gibson for another year before committing to him on a long term deal. The most I'd probably give Gibson is 3-years, $35 million. Assuming the qualifying offer isn't going anywhere (which may not be a safe assumption to make), the Twins can control Gibby for the next two seasons at something like $27 million. After that, he'll be heading into his age 33 season. I'd much rather see any extra money potentially headed Gibson's way be directed toward adding a year or two of control to the younger guys, much like what Cleveland did with Kluber, Carrasco and Jose Ramirez. I'm on board with this. As long as the QO sticks around, the Twins will be in solid position. The current CBA runs through 2021, so I think it is safe to assume the qualifying offer should still be around after 2019. I think the most important part of the Indians blueprint was that they were able to keep Kluber and Carrasco healthy and effective. No one today is lauding the Rays, Braves, Rangers or Reds for their ability to lock up Matt Moore, Julio Teheran, Matt Harrison or Homer Bailey into long-term, team-friendly extensions. If Falvey can't recreate the same good fortune with health and effectiveness with the Twins, then in a certain sense it doesn't really matter if they are able to sign Berrios to a long term deal or not. No, but why not sign your 2nd or 3rd best too? And, welcome to the site! That's fair. And thank you, I've enjoyed the site for some time now, figured it was about that time to put in my thoughts once in a while as well. Good article Nick. Very good. I think that any team that wants to seriously compete needs to overspend for quality staring pitchers. The operative word there is "quality." Remember the Orioles late 60s early 70s staff? Palmer, Cuellar, Dobson and McNally? Yes a 4 man rotation. Anyway, Cleveland's rotation reminds me of those guys. So my point is ..... identify the key guys and pay them well. It is worth it. If nothing else think of the time the FO saves looking for a jewel in the scrap heap. Just step up and pay. Then you are not having to worry about how to win 8-6 ball games. You are planning for a lot of 3-1 wins. Gibby had a bad start recently, but he has learned how to pitch finally. He should be extended. He is a #2 or 3. Romero looks like a future Berrios. Gonsalves... geez, what does this guy have yet to prove at AAA? We got some good guys in trades. I want to see us bring up some flame throwers to see what they can do. Nobody much mentions Jake Reed or Bard. We know what Duffy can do. Lets audition some guys like Reed that have been waiting in the wings. Well, Bailey and Harrison were nowhere near as team-friendly. Moore and Teheran were, and there was plenty of praise for those two deals, even as neither became stars -- there wasn't much risk on them. With help from his contract, Moore was flipped for Matt Duffy, and Teheran probably could have been flipped similarly in recent years although the Braves declined to do so. But yeah, I agree with your larger point -- health and effectiveness are more important than contracts. The uncertainty is your best bet.For me, I just don't see him or his agent accepting that contract.That's part of why my suggestion was higher, because I think it would have to be to get them to bite. But you might be right, market volatility may be our friend.